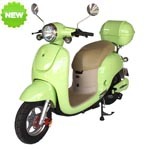 With its cheeky, voluptuous Continental styling, the MOTORINO XPe is bursting with joie de vivre. 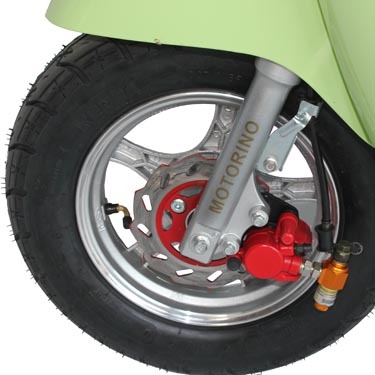 Smaller and lighter than most other MOTORINO XP models, it’s nimble and easy to park anywhere. Lower seat height better suits shorter riders and with the support of the adjustable rear shocks it can carry two people. Since it was designed with city-living in mind, the battery pack is user-removable so it can be charged off-bike or quickly swapped. Motor: MOTORINO CCT 500W 48V high-torque three-phase AC permanent-magnet brushless. 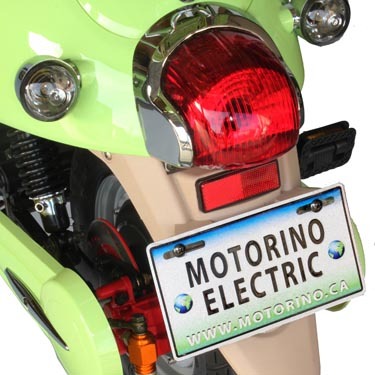 Motor Controller: MOTORINO CCT microprocessor-controlled with regenerative braking. Standard Equipment: 48V 20A-h sealed lead-acid (SLA) main. Optional: 48V 26A-h Lithium Ion (LiFePO4) main. Protection 40A resettable circuit breaker, low-voltage cut-out (by controller), LiFePO4-only: internal over and under voltage cut-out. Standard SLA: Outboard, 48V 3A Automatic Charger, 120VAC input ~7.5-hour charge time. Optional SLA: Outboard, 48V 4A Automatic Charger, 120VAC input ~5.5-hour charge time. Optional Lithium: Outboard, 48V 5A Automatic Charger, 120VAC input ~6-hour charge time. 12V Subsystem Converter: DC/DC 48V>12V 10A (powers all lighting and accessory outlet). Locks on battery box, rear box and underseat storage. ** Range is based on level ground, no stops, no winds, and in warm temperatures for a 75kg (165 lbs) rider with no extra cargo.